The arrival slot machine is a space age slot machine with loads of aliens to help you along the way. The main character is a green alien - watch him begin to scold you, if you don't spin those reels! Arrival is a 3D video slot with a cracking theme tune in the background - very much in the style of the new generation of video slots found in Las Vegas. 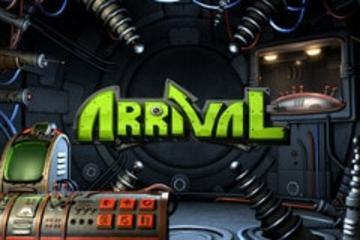 Arrival slot machine can be played here for free and real money. If you liked this free Arrival slot machine made by Betsoft, you might like to try some of these popular games which are also available in free-to-play mode. In addition to that, it is worth knowing that some casinos specialise in certain types of slots play. for example, high roller style players might like to take a look at our high limit slots rooms with games where you can play for real money jackpots. Also, players in certain countries will have different casinos to choose from. This means that players in the UK should look for UK slots rooms (for Fruit Machines), whilst those in Canada should head to our Canadian casinos section. Quite a few players are looking for the same games online that they can find in land-based casinos, rather than games like Arrival slots. We have a few, like Cleopatra slots and Monopoly as well as Wheel of Fortune, that you are welcome to play for free. You can though, visit our Vegas casinos online which lists the casinos that you might enjoy the most. Quite a few new online casinos offer great games, like this Arrival slot machine, which are just as good as the ones you have played in Las Vegas.